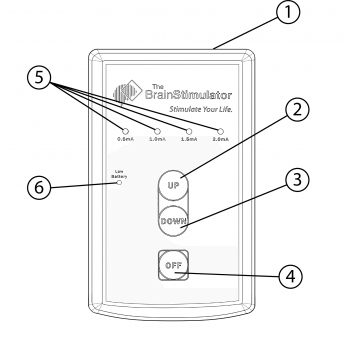 The Brain Stimulator is not a medical device and as such, it has not been reviewed or approved by the FDA. The Brain Stimulator does not claim to diagnose, assist, treat, improve, cure, or prevent any medical condition or ailment whatsoever. The Brain Stimulator, Inc. does not make any recommendations or claims with the sale of this kit, and what you do with it is your sole responsibility. Do not use Transcranial Direct Current Stimulation (tDCS) if you have any metal or electrical implants such as a pacemaker, or have a history of seizures. Do not use tDCS unless you have a full understanding of tDCS and have spoken with your primary care physician regarding any risks or concerns. By using The Brain Stimulator product you agree to these terms and conditions. (2) [UP] Button – Turns on the device, and increases the current level. (3) [DOWN] Button – Decreases the current level, and turns off the device from the 0.5mA level. (4) [OFF] Button – Instantly shuts off output current flow and turns off the device. (5) Current Indicating LEDs – When illuminated, indicates the level of current flowing. (6) Low Battery LED – Flashes YELLOW when the battery needs to be replaced, and RED in the unlikely event of an operation error. Reverse Battery Protection – Prevents the device from operating should the battery be installed incorrectly. Over-Current Protection – This feature prevents the device from ever exceeding 2.25mA at any time. If the device detects an over-current issue, the device will immediately shut off and the Low Battery LED will flash RED for 5 seconds. The device will not turn on again. In the unlikely event this should happen, please discontinue use and contact customer support. Over-Voltage Protection – This feature prevents the device from ever exceeding 13-volts at any time. If the device detects an over-voltage issue, the device will immediately shut off, and the Low Battery LED will flash RED for 5 seconds. The device will not turn on again. In the unlikely event this should happen, please discontinue use and contact customer support. For best results, we recommend using a new, non-rechargeable 9-volt battery. Slide the cover off of the back compartment on the device and insert your battery. Integrated Reverse Battery Protection prevents the device from operating if the battery is reversed, so if your device does not turn on, you may need to flip the battery to align the positive/negative (+/-) terminals. Take the white electrode cable supplied with your kit and insert the right-angled plug into the electrode port at the top of The Brain Stimulator. On the opposite end of the cable, you will find your electrode connectors. The Red connector is the Anode (positive, stimulating electrode) and the Black connector is the Cathode (negative, inhibiting electrode). You will need to differentiate the two connectors when you begin looking at electrode placements. Saline solution is an important factor in improving conductivity and ensuring a comfortable and effective tDCS session. Prepare saline solution by following the instructions featured on the back of your saline solution applicator bottle (available in our online store), or by mixing 1/4 teaspoon of salt, with 8oz of water in a cup. Generously apply the solution to the yellow sponges, until they are thoroughly saturated. Pressing the [UP] button once will turn on the device and slowly ramp up the current to 0.5mA. The blue illuminated LED indicates that the device is on and that output current is flowing. Once you feel comfortable, you can continue to increase the current level by pressing the [UP] button until you reach your desired stimulation level. We recommend pausing at each current level for 15-30 seconds, or until comfortable, to provide for a smooth transition. However, If you ever experience a sensation which you are uncomfortable with, stop your session immediately by using the [OFF] button. After 30 minutes of use, the device will begin slowly ramping down the current, and then power off. Should you wish to end your session earlier, simply press the [DOWN] button repeatedly to cycle through the current levels and turn off the device. Just as with increasing the current, when decreasing the current it’s best to pause momentarily at each current level to provide for a smooth transition. Alternatively, should you ever wish to end your session immediately, the [OFF] button acts as an “instant-off” feature. Please note, pressing the [OFF] button will instantly shut off the output current, while pressing the [DOWN] button slowly ramps down the output current. Slowly ramping down the current is the most comfortable way to end a tDCS session, therefore we recommend only using the [OFF] button if you feel the need to end your session immediately.